Thermal Receipt Printer, USB and Parallel Interfaces, Auto-cutter. Includes power supply. Order interface cables separately. Color: Dark gray. Thermal Receipt Printer, USB and Serial Interfaces, Auto-cutter. Power supply (Part# C825343) and cables sold separately. Color: Dark gray. Thermal Receipt Printer, USB and Parallel Interfaces, Auto-cutter. Includes power supply. Order interface cables separately. Color: Cool White. Thermal Receipt Printer, USB and Serial Interfaces, Auto-cutter, Energy Star Rated. Includes power supply. Order interface cables separately. 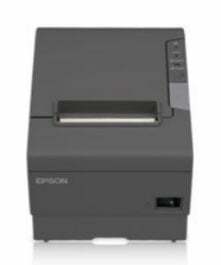 Color: Epson Black. Thermal Receipt Printer, USB + DM-D Interface, Auto-cutter. Includes power supply. Order interface cables separately. Color: Dark gray. Printer is super fast and we had it installed in a matter of minutes. This receipt printer is one of the fastest on the market. It prints clear and legible receipts and is perfect for any retail/restaurant environment.